A Budweiser ad reigned supreme once again at this year's US Super Bowl, followed by ads from Volkswagen and Mercedes-Benz. The 60-second spot, created by Anomaly, features a horse trainer reunited three years later with a ‘Budweiser Clydesdale’ horse he once breed. A bottle of Budweiser is only featured once during the ad, although the trainer wears a branded baseball cap throughout. Jake Scott, son of Ridley Scott, of RSA Films directed the ad. The spot has been shared 445,905 in the past 24-hours and has had over 4.7 million views on YouTube in the past seven days, according to data collected by Unruly Media. It has been shared over 1.5 million times globally on Facebook and 10,000 times on Twitter. 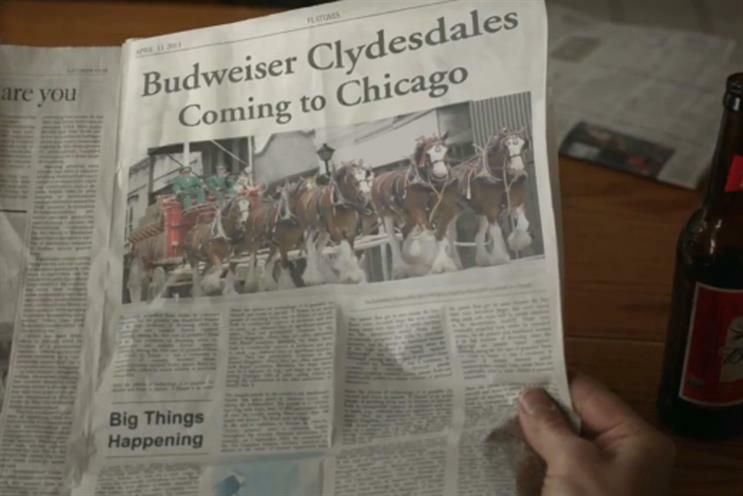 It is the second time in three years a Budweiser ad has triumphed at the Super Bowl. In 2011 Bud Light’s "dog sitter" ad by DDB topped a poll by US national newspaper, USA Today, as the public’s favourite. Volkswagen’s ad "get in. get happy" by Deutsch LA was the second most shared ad globally with over 8 million YouTube views and 224,000 Facebook shares in the last seven days. It has also been shared over 34,000 times in the past 24-hours. The ad was first unveiled nearly a week ago. Mercedes-Benz's, "soul", featuring Willem Dafoe by Merkley + Partners was the third most shared ad with 120,103 shares on Facebook and 4,701 shares on Twitter. It has been viewed over 3 million times on YouTube. The spot showed what impact driving a Mercedes could have on your life.